This new Marketing Strategy Book, “The 7-Step Easy Marketing Strategy Process – How to Maximize Business Results from your Marketing Efforts”, is worth checking out. The program is easy to follow, and will help you prioritze your marketing activities so you are selecting those activities that will truly increase software sales and drive new business. 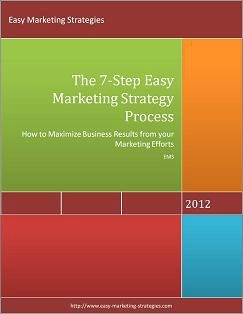 You can sign up for the 7-step marketing strategy program here: http://www.easy-marketing-strategies.com/marketing-strategy-book.html The program includes a 51-page eBook, marketing plan template, marketing strategy worksheet, 7-step program checklist, helpful tips for marketing activities, and more.